Since Fall 2012, the University of Oregon’s Department of Architecture and Center for Asian and Pacific Studies (CAPS) have hosted 30 visiting architects from the Shanghai Xian Dai Architectural Design Group as part of an international exchange. These award-winning architects were selected from thousands of employees for a firm-sponsored sabbatical abroad for sustainable design studies with recognized Pacific Northwest experts. The architects were in residence for ten weeks in Eugene, where they had a Sustainable Design Seminar, Cross-Cultural Communication workshops, and placement with a design studio or research group. The program begins in winter term, after 10-week studies at UO, architects joined the professional exchange with American design firms across the country for another 8-10 weeks. The goal of combined school study and professional work is to help visiting architects experience top-quality sustainable environments from all perspectives. The visiting architects participate in many classes at UO including a seminar “Sustainable Design” that is designed to meet their needs, Cross-Cultural Communication workshops, and audit a variety of classes that fit their individual interests. In the Sustainable Design Seminar, the instructor Dr. Lanbin Ren has invited a number of UO faculty to share their expertise in sustainability with visiting architects. In Fall 2013, 10 visiting architects joined the Xian Dai Studio led by Professor G.Z. Brown, Dr. Lanbin Ren, and ESBL Staff. The studio focused on green technologies in modern architecture. Architects had a chance to revise their own projects according to the new skills and knowledge they have learned in the studio. In Winter 2015, 11 visiting architects and 7 UO architecture students participated the studio, Two Countries, One Planet, co-taught by Nancy Yen-wen Cheng and Dr. Lanbin Ren. This focused on cross-cultural learning and sustainability: DESIGN WITH NATURE: sun, water and wind. Emphasis was placed on low-cost energy-efficiency through load reduction, passive solar, daylighting and natural ventilation, secondarily looking at integration of solar thermal and photo-voltaic panels. Visiting architects and architecture students together created a master plan for the downtown renovation of Milwaukie, Oregon. 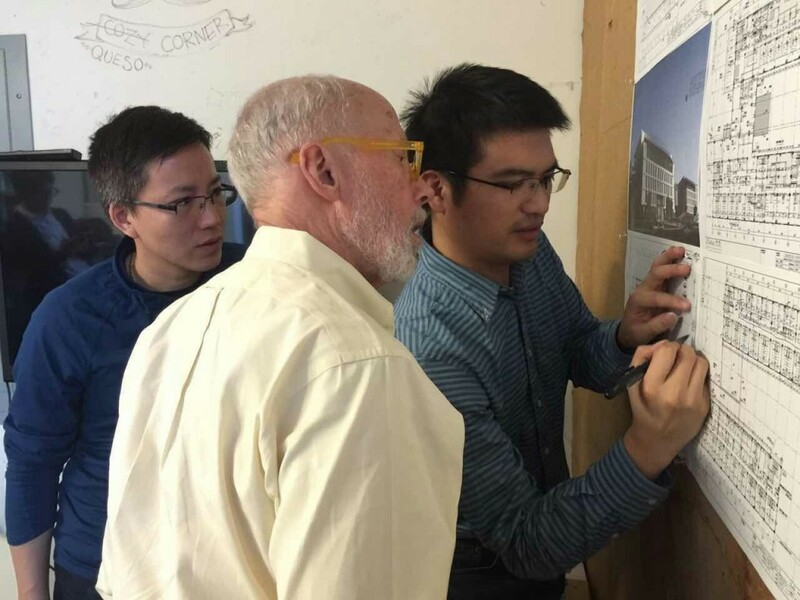 Beyond classes and studios, visiting Xian Dai architects also actively involved in studio reviews where they share their expertise from the award-wining professional work with UO architecture students in land use planning, site analysis, building design, and many more. Visiting architects also visit many sustainable cities, districts, and buildings across the country including Seattle, San Francisco, Portland Green District, and many buildings on the UO campus. Learning from projects helps visiting architects understand the design implementation of innovative concepts and technologies related to sustainability. Since 2015, visiting architects were placed in a few American design firms which are specialized in sustainability including HKS Architects in Dallas, TX, GBD Architects and SRG Partnership in Portland, and PIVOT Architecture in Eugene, OR. Architects have gained the first-hand experience in American work environment and shared their expertise with their American coworkers. Architects have reported both their communication skills in English and design abilities are significantly improved through the professional exchange.